TM Forum Frameworx is an enterprise architecture framework for the telecom industries. The product provides the Frameworx source contents translated into an Enterprise Architect EAP project file and a corresponding Frameworx MDG technology add-in. The Frameworx contents for Enterprise Architect currently include the meta-data-rich model and object contents of eTOM and TAM. Frameworx for Enterprise Architect contents include packages, diagrams, elements and their meta-data. For more details please see TM Forum Frameworx for Enterprise Architect. 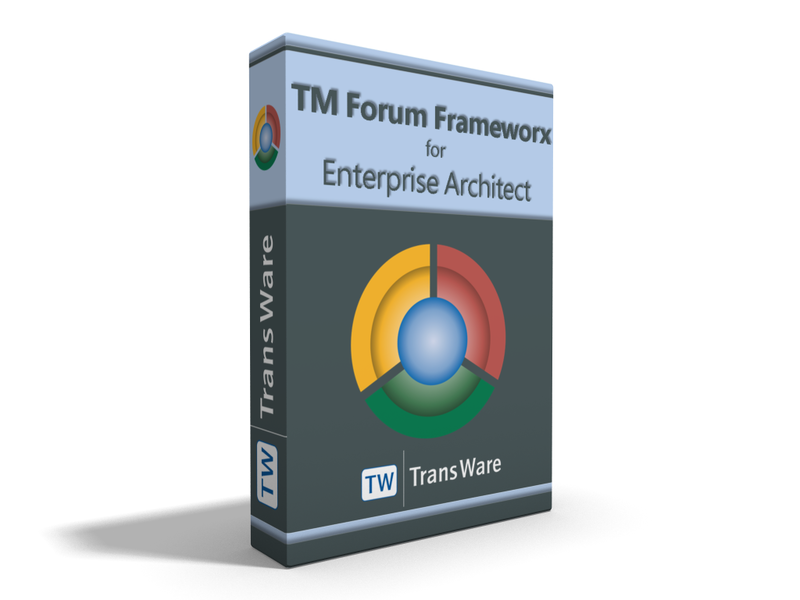 This license for TM Forum Frameworx for Enterprise Architect is a floating license. Floating license means that licenses can be granted to users under control of the Sparx Systems™ Keystore Services. Within the count of purchased licenses and upon user request the services check availability and allocate one license to one user for a limited period of time. The request may be executed by users repeatedly within the count of available licenses at any given time. Any use of the translated content outside of TM Forum Frameworx, like converting of content to other tools, is deemed to be a use outside the scope of the license and is not permitted, unless such use is covered by a separate license purchase. For the floating license installation the Sparx Systems™ Keystore Services are a prerequisite (see system requirements). TM Forum is the organization that owns the intellectual property on Frameworx and continuously maintains its contents. TransWare AG is a member and partner of TM Forum and has made Frameworx accessible to the modeling tool Sparx Systems™ Enterprise Architect. Licenses can be purchased by TM Forum members only. TM Forum Frameworx for Enterprise Architect requires the Sparx Systems™ Enterprise Architect software as of version 13.5 or higher. Floating licenses require the Sparx Systems™ Keystore Services. These services provide the facility to administer the licenses. Keystore Services are cost-free and can be can be downloaded by registered users from the Sparx Systems website. For information regarding floating licenses please see the Enterprise Architect floating licence details. TM Forum Frameworx for Enterprise Architect is delivered as a Microsoft® Windows® Installer MSI setup file. The setup installs the Frameworx contents and the Frameworx MDG technology add-in for Enterprise Architect. TransWare AG provides tools and services for custom translation of modeling tool data from and to Sparx Systems Enterprise Architect. TransWare AG has develop the Frameworx Add-on based on Enterprise Architect MGD technology and UML profiles. TransWare AG has all skills and resources for training and development of MGD and UML profiles on custom requirements. If older Frameworx versions are required TransWare AG can provide these versions for Enterprise Architect by custom Translation on demand. All software is delivered electronically through download links in an email, so there will be no physical items shipped to your address. The license key(s) will be delivered within one business day. Your purchased software will be delivered to the email address in your order. If you do not receive this email in a reasonable timescale after your purchase including payment is completed, please contact TransWare at your erliest convenience.